The origins of the English Erratic boulders are shrouded in mystery and intrigue for many people. Mainstream geologists generally try to ignore the widespread distribution of erratic boulders in Southern England because there is no credible evidence that ice sheets travelled this far south. The usual mainstream response is to suggest a particular specimen is probably a “glacial erratic”. The suggestion is often followed by a quick exit before anybody can ask an awkward question. Unsurprisingly, the lack of a credible mainstream explanation has encouraged many other hypothesises – some with tragicomedy consequences. 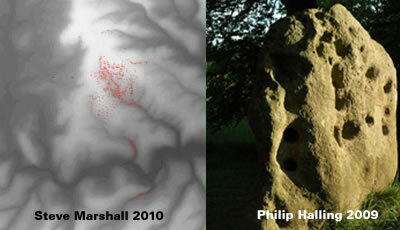 The first real geologic clue regarding the English erratic boulders is found at Stonehenge. The chalk dug from the ditch was piled up to form the bank. This first stage is dated to around 3100 BC, after which the ditch began to silt up naturally. Intriguingly, only “worked flint” stones are associated with the original Stonehenge earthworks. There is no evidence of bluestones, large or small. There is no evidence of sarsen stones, large or small, that are said to “litter” the chalk downs. Just chalk, bones, “worked flint tools” and a lot conjecture. However, 500 years later, the Stonehenge monument incorporated bluestones and sarsen stones. Confusingly, Bluestone is not a type of rock but a general descriptor for “foreign” stones. Stonehenge, for example, incorporates “at least 20 different” types of bluestone – some of which have been traced back to the Preseli Hills in West Wales. The term “bluestone” in Britain is used in a loose sense to cover all of the “foreign” stones at Stonehenge. It is a “convenience” label rather than a geological term, since at least 20 different rock types are represented. One of the most common rocks in the assemblage is known as Preseli Spotted Dolerite—a chemically altered igneous rock containing spots or clusters of plagioclase feldspar. The stones weigh between 2 and 4 tons each. 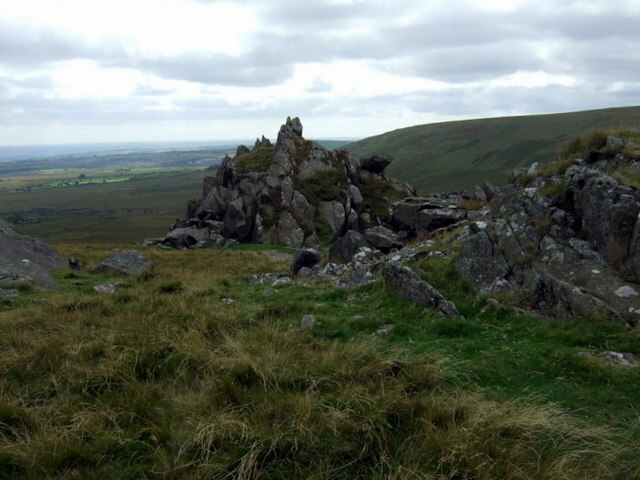 The Preseli Hills or Preseli Mountains are a range of hills in north Pembrokeshire, West Wales. They form part of the Pembrokeshire Coast National Park. In 1923 the petrologist Herbert Henry Thomas identified that bluestone from the hills corresponded to that used to build the inner circle of Stonehenge, and more recent geologists have identified Carn Menyn, sometimes called Carn Meini, as one of the bluestone sources. Geochemical analysis has shown that some of the bluestones from the inner horseshoe at Stonehenge probably came from Carn Menyn, Carngoedog, Carnbreseb, Cerrigmarchogion and other sites in the Preseli Hills, while rhyolite fragments may have come from Carnalw and further afield. There is evidence that a West Wales bluestone was incorporated into Boles Barrow which is about twelve miles west of Stonehenge – near Warminster. The most compelling evidence for glacial transport of the bluestones is that at least one substantial block was on Salisbury Plain centuries before the construction of Stonehenge. It lay in the Neolithic Boles Barrow which had been blocked up and abandoned long before the bluestone circle was erected. 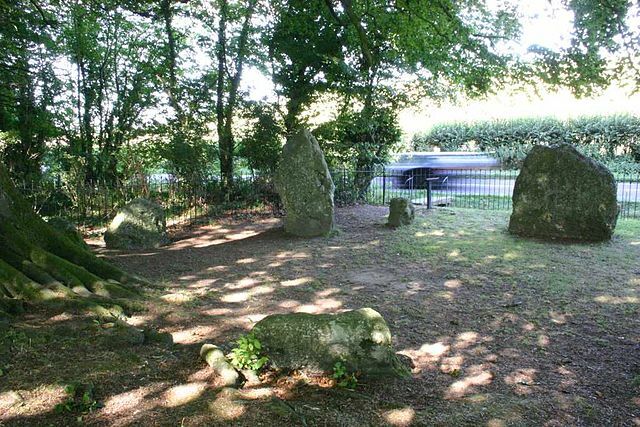 Following his excavation of Boles Barrow of 1801, William Cunnington wrote of the barrow’s `large stones’ amongst which he discovered a `Blue hard stone ye same as the upright Stones in ye inner circle at Stonehenge’. 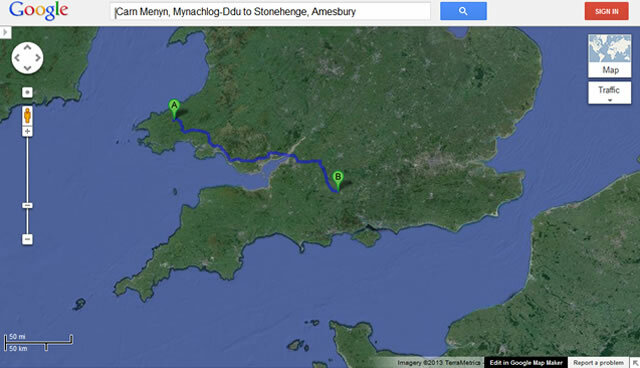 Additionally, erratics from West Wales have been found near Cardiff and the Bristol Channel. erratics from West Wales have been identified two-thirds of the way from the Preselis to Salisbury Plain at a site near Cardiff, and also on Flatholme and Steep Holme islands in the Bristol Channel less than 60 miles west of Stonehenge. The conundrum of the West Wales bluestones has generated much debate between the believers in “glacial erratics” and the “superhuman feat of men” brigade. Archaeologists have been even firmer in their belief in an almost superhuman feat of men transferring some 80 heavy slabs a distance of over 200 miles. Wikipedia happily plays one group against the other. Misdirection regarding the Irish Sea Glacier encourages the Etch A Sketch glaciologists. 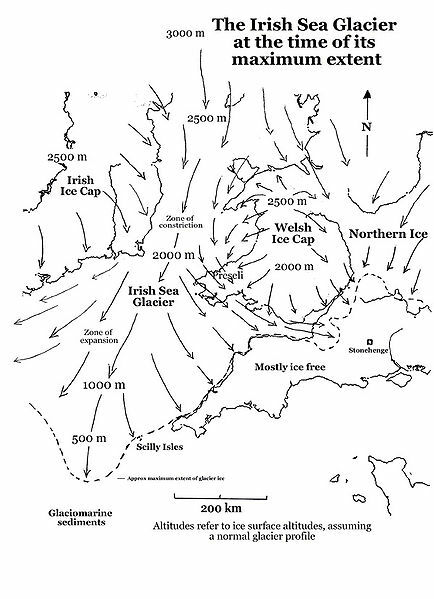 If a glacier transported the stones, then it must have been the Irish Sea Glacier. Misdirection regarding human transportation has fuelled some tragicomedy enterprises. The majority of them are believed to have been brought from the Preseli Hills, about 250 miles away in Wales, either through glaciation (glacial erratic theory) or through humans organizing their transportation. Brian John provides a wonderful description of the tragic comedy that unfolds when the “superhuman feat of men” brigade re-enact the transportation of a bluestone to Stonehenge. The demands of such an enterprise were underlined by the attempt by a group led by Phil Bowen and given lottery money last year to reproduce the journey. As a scientific experiment it was sadly flawed. From the beginning the project was compromised by a series of economies, precautions and shortcuts. A bluestone one ton lighter than any at Stonehenge was chosen. It was dragged on a sledge from the Preselis, though not over rough ground but along mesh-covered roads. A lorry was used to take the load over difficult slopes. At the coast the stone was lashed on a cradle between two lightweight curraghs or coracles instead of being laden onto a sensible, well-constructed raft. At the end of the intended voyage the team planned to avoid the challenge of rivers and an arduous cross-country haul by floating the cargo on a barge along the Kennet & Avon canal – not an option that would have been open to the people who built Stonehenge. Yet even with these spurious adaptations the mission ended abruptly just four miles out to sea when the stone slipped from its lashings, fell into the water and sank 60 feet to the muddy bottom of Freshwater Bay, Pembrokeshire, with its sharp currents. The ‘reconstruction’ was an ill-researched, ill-prepared fiasco. But its failure does emphasise how difficult and dangerous a genuine adventure would have been. Undoubtedly, the protagonists in the bluestone debate require another alternative. Mainstream sources generally play scant attention to puddingstone and frequently redirect towards Hertfordshire puddingstone which is simply described as “a conglomerate sedimentary rock”. Hertfordshire puddingstone is a conglomerate sedimentary rock composed of rounded flint pebbles cemented together by a younger matrix of silica quartz. The distinctive rock is largely confined to the English county of Hertfordshire but small amounts occur throughout the London Basin. Despite a superficial similarity to concrete it is entirely natural. Like other puddingstones, it derives its name from the manner in which the embedded flints resemble the plums in a Christmas pudding. Wikipedia blandly states that “small amounts occur throughout the London Basin”. What Wikipedia doesn’t say explicitly state is that these “small amounts” are erratics. However, Wikipedia does explicitly misdirect by suggesting the Plumstead [South London] puddingstone was “left behind after the last Ice Age. Plumstead Common has a fine example of puddingstone, probably left behind after the last Ice Age. Additionally, Wikipedia is being economical with the truth when it mentions the “London Basin” because puddingstone erratics litter southern Britain. Unfortunately, tracking down puddingstones via the internet is a fairly random affair but there is sufficient evidence to suggest there is more to puddingstones than just Hertfordshire puddingstone. This thought prompted Dr Ernest Rudge to embark upon a heroic quest for a “Lost Highway” which he believed was a Neolithic trade route delineated by maker stones made of puddingstone. Dr Rudge began his research sometime in the 1940’s and published his first paper in 1949. Thereafter, he continued to publish his work in popular and academic journals, copies of which I retain. He was no armchair theorist, but a dedicated fieldworker who, accompanied by his wife Lilian, went out to search for puddingstones. He began close to home near Waltham Abbey. After 50 years of painstaking research Dr Rudge had traced his “Lost Highway” from Grime Graves in Norfolk to Great Bedwyn in Wiltshire. Tragically, Dr Rudge only looked for puddingstone that lay along his predetermined route. Mainstream sources generally try to play scant attention to sarsen stone erratic boulders. Wikipedia embarrassingly suggests they are “post-glacial remains”. Unfortunately, the seven counties [in southern England] that are acknowledged to contain sarsen stones display no other signs of a glacial past. Sarsen stones are sandstone blocks found in quantity in the United Kingdom on Salisbury Plain, the Marlborough Downs, in Kent, and in smaller quantities in Berkshire, Essex, Oxfordshire, Dorset and Hampshire. They are the post-glacial remains of a cap of tertiary silcrete which once covered much of southern England, a dense, hard rock created from sand bound by a silica cement, making it a kind of silicified sandstone. Regrettably, the Stonehenge enthusiasts have also paid scant attention to the sarsen stones. During the next major phase of activity, 30 enormous Oligocene-Miocene sarsen stones were brought to the site. They may have come from a quarry, around 25 miles (40 km) north of Stonehenge on the Marlborough Downs, or they may have been collected from a “litter” of sarsens on the chalk downs, closer to hand. The massive vertical pillars that one thinks of as archetypically Stonehenge are sarsens that originate from the Marlborough Downs eighteen miles to the north. There has been little controversy about them. As long ago as the seventeenth century the architect Inigo Jones (1573-1652) wrote, in a book published in 1655, the same kind of Stone whereof this Antiquity consists, may be found, especially about Aibury in North-Wiltshire, not many miles distant from it, where are not only quarries of the like stone, but also stones of far greater dimensions then any at Stonehenge, may be had. Evidently the “superhuman feat of men” brigade is satisfied that the Stonehenge sarsen stones [weighing up to 50 tons each] were transported across the Wiltshire downs from a quarry 40 kilometres away. 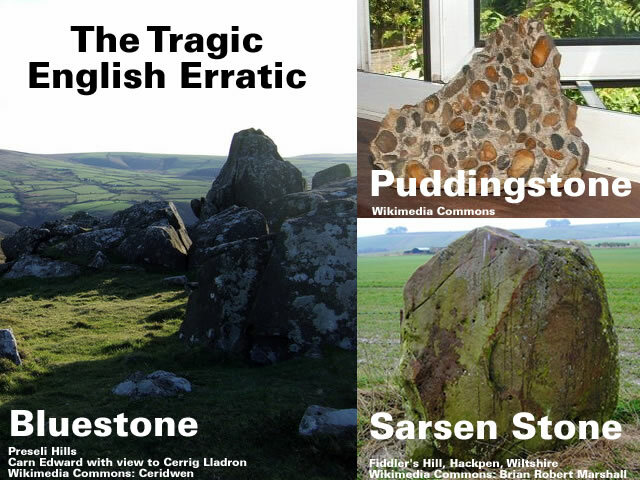 However, that hypothesis does not explain away the many sarsen [derived from the 17th century use of the word Saracen, denoting something foreign and unusual] stones that “litter” southern England. Thankfully, the excellent work of Steve Marshall has significantly enhanced our understanding. Sarsen is an extremely hard and brittle form of sandstone, cemented by silica. It is found typically in the bottom of dry valleys, where it lies scattered in large drifts or ‘trains’. It seems far more likely that the holes in sarsen were made by mangroves, which thrive in salt water and put out a spreading maze of roots which help stabilise the plant in soft mud. They also have projecting roots that act as ‘breathing tubes’ and compensate for the anoxic nature of mud. The pattern of the sarsen stones on the Wiltshire downs provides the second real clue because the distribution pattern strongly suggests the sarsen stones were positioned by water. The wider distribution pattern of erratic boulders over southern England is equally suggestive of a water driven distribution pattern with flooding [from west to east] that fans out across East Anglia and South East England. However, this is flooding on a scale that is unfamiliar. This is flooding driven by a massive tsunami that crashed into Wales and England. This is flooding that transports bluestones from West Wales to Wiltshire. This is flooding that transports erratic boulders across England to Norfolk, Suffolk, Essex and Kent. This is flooding that deposits large quantities of “imported rock” in Essex. The boulder clay of Essex contains many glacial erratics that have been transported from distant locations. An amazing variety of rocks can be found and by matching rock types with known outcrops in other parts of Britain geologists are able to establish the direction of ice movement across the country from its origins in Scotland or Scandinavia. Some of the largest glacial erratics found in Essex can be seen in prominent positions in villages and towns. Most of these are puddingstones and sarsens but other rock types are sometimes encountered. The vast majority of the boulders and pebbles in the Kesgrave Sands and Gravels were brought to Essex from the west by the early River Thames. This is flooding that deposits flints [from the English Downs] and puddingstone in Essex. Almost all are flint (some containing fossils from the Chalk sea) but there is also quartzite and puddingstone. This is flooding that deposits rocks from North Wales in Essex. Various pebbles of quartz and volcanic rocks derived from North Wales are also present and this indicates that the Thames may have originally drained the Welsh mountains before its headwaters were captured by the River Severn. This is flooding that shreds trees and deposits the triage in Essex. Large pieces of silicified fossil wood (wood replaced by quartz) may also be found in these gravels and these can sometimes reveal beautiful colour banding and growth rings when cut and polished. The source of this fossil wood, and thus its age, has never been established. This is flooding that transports pebbles from Cornwall all the way to Chelmsford, Essex. Occasionally a specimen is found which creates a lot of interest. One such pebble, collected in 1987 from the Kesgrave Sands and Gravels at a Chelmsford gravel quarry was, because of its tin content and unique composition, proved to have originated in Cornwall. Its 400 million year journey had been via many ancient river systems before it was finally brought to Essex from the Midlands by the ancestral Thames. That is the sad neglected tale of the Tragic English Erratic. The English Erratic is not a glacial erratic. The English Erratic is a tsunami erratic. Mainstream geologists prefer to classify “Tsunami Triage” as “Glacial Debris” because they obtain comfort from an irrational belief in [inexplicable] Ice Ages. Cognitive dissonance theory explains human behavior by positing that people have a bias to seek consonance between their expectations and reality. According to Festinger, people engage in a process he termed “dissonance reduction,” which can be achieved in one of three ways: lowering the importance of one of the discordant factors, adding consonant elements, or changing one of the dissonant factors. This bias sheds light on otherwise puzzling, irrational, and even destructive behavior. a) Ice Ages unless the “evidence” relates to a change in axial tilt or orbital distance from the Sun. b) Ice Sheets unless the “evidence” relates to high [polar] latitudes or high [glacial] altitudes. Thus, the mainstream “Glacial Debris” [found at lower latitudes and lower altitudes] should be rationally interpreted as “Tsunami Triage”. Reviewing the mainstream “Ice Age” literature indicates that the “Tsunami Triage” that litters southern England has been classified [by the mainstream] as the “Anglian Glaciation”. This was the third in the lecture series on Second Nature with Professor Phil Gibbard. However, when reviewing the mainstream “Ice Ages” evidence it is advisable to search internationally because [like all good myths and belief systems] the “evidence” is partitioned and customised for the local market. A European perspective of the “Anglian Glaciation” is presented to the Finnish market. 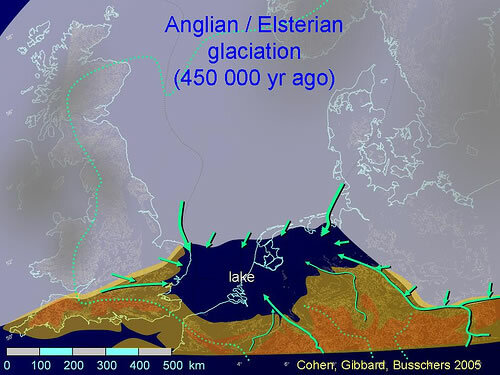 European ice sheet maximum during the Anglian glaciation 478-424,000 years ago. Looking at the British Isles [in the above map] during the “Anglian Glaciation” [478-424,000 mainstream years ago] is very intriguing because the “Tsunami Triage” interpretation raises many issues the mainstream prefers to ignore. Firstly, the red line crossing southern Ireland indicates that when the Tsunami struck [478-424,000 mainstream years ago] there was far less separation between Ireland, Wales and England. The westward stretching [and sinking] of the continent shelf into the Atlantic Ocean was far less advanced [or non existent] and the Irish Sea and Bristol Channel were far smaller [or non existent]. Secondly, the red line crossing southern Holland indicates that when the Tsunami struck [478-424,000 mainstream years ago] there was far less separation between the British Isles and Europe. The westward stretching [and sinking] of the continent shelf into the Atlantic Ocean was far less advanced with the North Sea and English Channel being far smaller. These are the uncomfortable observations that the mainstream myth makers mendaciously mask. Gallery | This entry was posted in Catastrophism, Earth, Geology, Water. Bookmark the permalink. 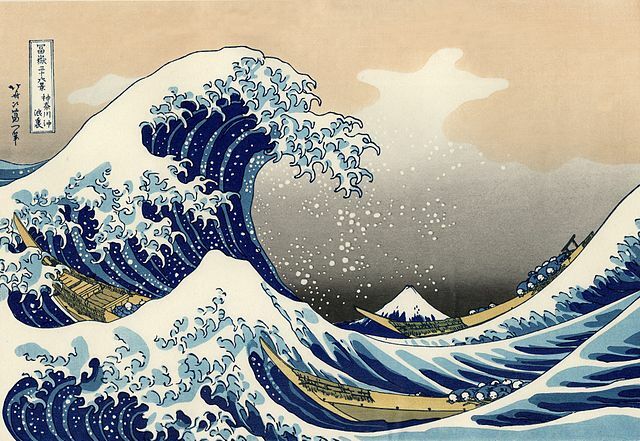 Well done … The first time i have seen Tsunami instead of Glacial on a site since reading Velikovsky back in the 70’s. Cognitive Dissonance indeed !! !